The battle for control over Mazda Raceway Laguna Seca read like a poorly-written high school play when it came to light last year. Old grudges, new backstabbing, and general hostilities pierced the illusion of serenity and stability at the famed coastal circuit, and while the situation has steadily improved over the last 12 months, one truth remains unchanged: Laguna Seca, as we know it, is flirting with extinction. Nice article. With the current sound restrictions - it's almost impossible to enjoy going there for me. Prefer Sears Point anyway - and Thunderhill is closer and always cheaper - not to mention more fun to run. Good article though and it sums up the issues nicely. Hey rastta -- was that your car I saw at Sonoma on Sunday? I remember seeing a red Boxster and thinking about it and then promptly forgot to track down the owner. If you're looking for AMB transponder times for the day I have the full data. Laguna Seca will not close, it may be under new management but Monterey County knows very well how much revenue LS brings into Monterey County businesses big and small and money talks here in MC. The revenue from Car Week alone makes some small businesses's year. Interesting article. I will be waiting to see what happens with interest. I have always thought it is a shame that events at LG have to end so early. We attend events in Europe and the UK and many have activities that keep people around after the racing has finished. Food (and better quality than the tired old regular concessions), music, car shows, beer tents, etc. We had friends with us for last years Rennsport and were amazed that they were chucking out all the people so early each day! Much lost opportunity and revenue. My favorite track here in the Northeast - Lime Rock Park - continuously fights the same battle with noise restrictions. Fortunately, it's privately owned, so there's a lot less political maneuvering. What defies belief are the wealthy and famous (to include Teenage Mutant Ninja Turtles movie star Laura Linney) who buy houses near the track and are shocked to discover that race cars are loud. Consequently, there is strict enforcement of the 1959 ordinance limiting sound levels to 86db. Also, thanks to the local church and a ridiculous and outdated Connecticut state law, no racing on Sundays. Yup - that was me - I was there with CFRA. I was accessing the transponder info from their website live link. OK, now I've put 2 + 2 together. I'm the one managing the timing system and driving the maroon Spec Boxster in the race group. I'll be back in November - I'll try and come by and introduce myself. Saw the Spec Boxster. Hoping to move into the Race Group sometime next year. 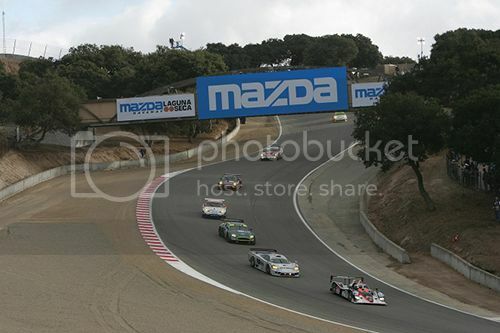 Monterey County's board of supervisors has chosen the newly formed "Friends of Laguna Seca" (FLS) group to enter negotiations that could lead to its long-term control of Mazda Raceway Laguna Seca and the surrounding property that contains the famed road course. The decision comes after a busy year where there board sought proposals for a new management and concession agreement that would increase revenue while revitalizing the aging facility. Of the three parties that were considered for the job, the Sports Car Racing Association of the Monterey Peninsula (SCRAMP) – Laguna Seca's one and only concessionaire since its formation in 1957 – joined forces with NASCAR's International Speedway Corporation, the Chris Pook-led World Automotive Championship of California, and FLS made presentations to the board. FLS, the only non-profit group, will enter the next phase of the process where it will negotiate with the county to create a concession agreement. The completion of that process hinges upon both sides creating an acceptable contract and, according to a statement provided by the county, SCRAMP+ISC and WACC have not been ruled out from further negotiations. "A final decision on a concession will depend on the ability to reach mutually agreeable terms, and require Board of Supervisors approval in a public session," it wrote in a statement published by the Monterey Herald. "While initially the county will negotiate with Friends of Laguna Seca, all other potential candidates are still seen as viable candidates." Out of all the potential groups F.L.S. seem to have a plan that includes investment and also a local connection.